The debate between open office spaces and cubicles is a never ending battle, it seems – but why do companies cling so stubbornly to the idea that cubicle = bad and open = good? The answer isn’t hard and fast – rather the question is wrong. The type of work being done and the type of people doing it determines whether an open office space or a cubicle based design will work best. So what’s the most common problem with open plan offices? The main issue with open plan offices is the feeling of being in a middle school cafeteria. It’s known as benching in the adult world; when rows and rows of tables are set in a vast open space. The idea, of course, is that everyone has access to everyone else and that collaborative and creative processes will benefit – it take a village to complete a project. The hope is that the team will be more effective. This approach doesn’t always work. Sadly, this is often not the case. We live in a world where isolation is more and more common, and social contact is as likely to be virtual as physical. Working in the same manner is a given for many. This kind of work style, however, takes time to be recognized, and in the meantime far to many office analysts are insisting that collaborative efforts in an open space environment will yield higher productivity and better results. The problem isn’t the idea of collaboration – it’s with the rigid thinking about what kind of space encourages it. The solution is often not a full return to closed offices or cubicles, but a blended office that allows those who work better in private the ability to separate from the herd and focus, while those who thrive on real time, physical and verbal stimulation from peers to access the hive mind for better creative flow. Next Saturday we’ll explore some specific tips for blended office space as well as highlight common pitfalls and solutions for keeping creativity at a peak while allowing more laid back employees the room and quiet they need to shine. If you lease or purchase office space in New Orleans, revamping your square footage with office partitions or dividers may be the best way to utilize space previously designed for any number of other purposes. The goal is to always give employees the work environment they need to operate at maximum productivity. While building new walls is one answer, office partitions can be a little more flexible, letting you create a variety of office spaces based on your needs instead of a cookie cutter approach. The first step to breaking up a monotonous large space is to invest in office partitions, which can be prefabricated then delivered/installed as needed. While some partitions go floor to ceiling, a similar product can be used that only reaches to average head height – with the remaining height filled with glass to let in light. Smaller office partitions can installed at individual workstations; these include both freestanding cubicle panels and desk mounted privacy panels. The nice thing about removable modules is that you can choose from a variety of heights and change the cubicle dimensions at will, allowing for a more open feeling or a more private cubicle as needed. By offering a more senior employee the option of a larger workspace you can attract better talent to work in your New Orleans office. Furniture options can be upgraded to suit a more prestigious space, and additional perks may be offered as well – like exclusive use of a station in a situation where many must share with others. Using partitions to offer specialized areas of the office can also work to your advantage when it comes to maintaining employee satisfaction and morale – consider a sound protected area for important or sensitive phone calls, and designate one area as a break room if needed. If you really want to make an impact and be known as a terrific small or large business to work for, you can even have a secluded room for private matters such as pumping breast milk or administering insulin shots for employees who might feel uncomfortable or cramped doing it in the less sanitary conditions of the lavatory. Use your space wisely and watch office space planning for your Louisiana business pay off! If you have an brick and mortar business based in New Orleans, office furniture that fits your available space is a must. However, many offices in older buildings are smaller than those commonly structured today, and the sprawling desk plans that are more palatable to many preferences simply don’t always fit. How do you shrink your office needs to fit the space available? Here are three ways to create more space for your office furniture even in cramped quarters. In the digital age, not every desk needs a filing cabinet. Everything each employee needs is on their desktop. Office desks with filing cabinets attached are unnecessary. Consider putting a unit in one corner and assigning each employee a drawer, or if you can centralize further, use the filing system office-wide for all and have one drawer devoted to individual employee needs separated by folders. Encourage employee to use digital options whenever possible. Scan in any documents possible, including invoices, receipts, and other small papers – use a back-up drive or cloud storage to avoid loss in case of power outage. If papers absolutely must be kept, file them and store every 3-6 months in a box clearly marked with beginning and end dates. Use email instead of fax when possible, and encourage tablet use for meetings to avoid having to print out multiple hard copies of presentations or files. This also cuts down on clutter and eliminates the need for cases of paper. It’s worth having the professionals come in and take a look at your available space and offer insight. The Office Planning Group helps new Orleans businesses efficiently fit their office furniture into their office space with room to spare, a clear flow for foot traffic, accessibility for items such as printers and copiers, and enough elbow room for everyone in the building. Smaller pieces of office furniture can be slid back to back, tucked into corners, or even arranged in a square with a common area in the center for easy access. A well laid out office can make all the difference. Choose your puzzle pieces wisely, and your office will not only be efficient, it will be comfortable to work in and present a professional appearance to clients. With prime office space at a premium in New Orleans, making the most of every precious square foot is a priority. The type of office furniture chosen to fit the space available is key. Picking the right shape, size and style of office furniture can lead to higher efficiency, more elbow and leg room, and extra storage space. 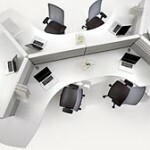 L shape desks are perfect for this specific type of office. L-shaped desks are traditionally set in a corner, to provide a large work station for a single person. This can be a good option of the office is small and a centrally placed executive desk is impractical. However, it can be awkward if clients are regularly entertained in the office, as facing the corner to use a computer or check files puts the desk-user’s back to their visitors. A better plan would be to put one leg of the L directly against the wall and ending in the corner. This provides a spacious workspace that faces the wall, where a calendar can be hung or a view out of the window is available. The other leg can extend to the center of the room, so that the office manager need only pivot their chair 90 degrees to the left or right to face clients across the open expanse of desk. Other options for L shaped desks include the ability for two employees to share space without restricting leg room or bumping elbows. With one person on the inside of the L and the other on the outside, each worker has ample desktop space and legroom; and can share items such as a centrally located printer, power strip or assorted desk supplies tray. 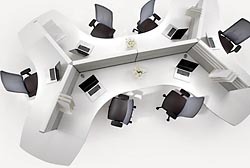 Finally, for very crowded spaces, two L shaped desks pushed together so the legs meet forming an elongated U can create enough space for six workers, at a pinch. Alternating seating in the inside and outside provide just enough leg and elbow room and combination PC and monitor setups leaves enough space for office supplies if needed. Consider L shape desks for narrow New Orleans office spaces and benefit from efficient use of square footage while keeping employees and clients from feeling cramped.